Senior Jasmine Hilton scored a game-high 23 points to lead the Lady Panthers to victory over Eleanor Roosevelt on Feb. 22. Photo by Micheal Smith/The Prince George's Sentinel. 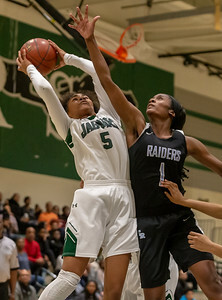 Springdale, MD, Friday, February 22, 2019: Jasmine Hilton (5) of Flowers and Daja Claiborne (1) of Roosevelt via for the opening tip during a Prince George's County girl's high school basketball game between Eleanor Roosevelt and C.H. Flowers held at C.H. Flowers High School in Springdale, MD. (Michael R. Smith/The Prince George's Sentinel). 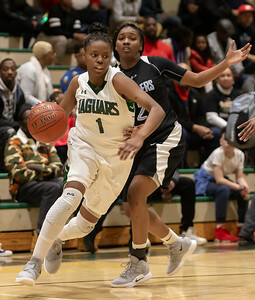 Springdale, MD, Friday, February 22, 2019: Kaniyah Harris (1) of Flowers drives around Trinity Workman (2) during a Prince George's County girl's high school basketball game between Eleanor Roosevelt and C.H. Flowers held at C.H. Flowers High School in Springdale, MD. (Michael R. Smith/The Prince George's Sentinel). 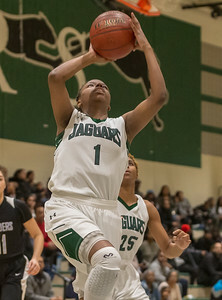 Springdale, MD, Friday, February 22, 2019: Kaniyah Harris (1) of Flowers scores a 1st quarter layup during a Prince George's County girl's high school basketball game between Eleanor Roosevelt and C.H. Flowers held at C.H. Flowers High School in Springdale, MD. (Michael R. Smith/The Prince George's Sentinel). 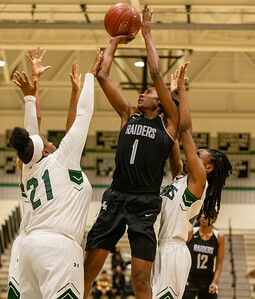 Springdale, MD, Friday, February 22, 2019: Jasmine Hilton (5) is met by two Roosevelt defenders during a Prince George's County girl's high school basketball game between Eleanor Roosevelt and C.H. Flowers held at C.H. Flowers High School in Springdale, MD. (Michael R. Smith/The Prince George's Sentinel). 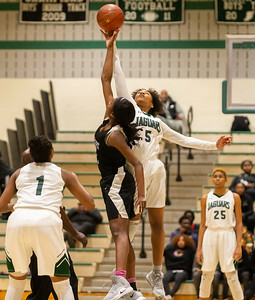 Springdale, MD, Friday, February 22, 2019: Jasmine Hilton (5) of Flowers grabs a rebound over Daja Claiborne (1) during a Prince George's County girl's high school basketball game between Eleanor Roosevelt and C.H. Flowers held at C.H. Flowers High School in Springdale, MD. (Michael R. Smith/The Prince George's Sentinel). 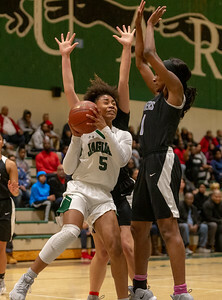 Springdale, MD, Friday, February 22, 2019: Indira Nzerue (10) plays defense as the Roosevelt ballhandler dribbles up court during a Prince George's County girl's high school basketball game between Eleanor Roosevelt and C.H. Flowers held at C.H. Flowers High School in Springdale, MD. (Michael R. Smith/The Prince George's Sentinel). 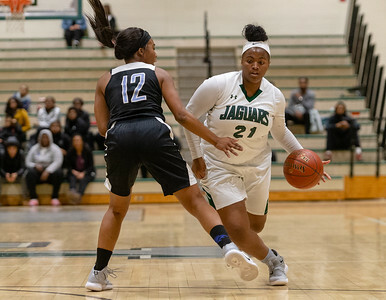 Springdale, MD, Friday, February 22, 2019: Cori Robinson (21) dribbles past Nylah Lee (12) during a Prince George's County girl's high school basketball game between Eleanor Roosevelt and C.H. Flowers held at C.H. Flowers High School in Springdale, MD. (Michael R. Smith/The Prince George's Sentinel). 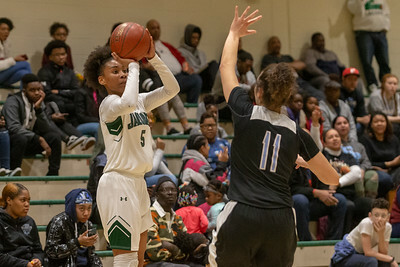 Springdale, MD, Friday, February 22, 2019: Jasmine Hilton (5) of Flowers scored 23 points during a Prince George's County girl's high school basketball game between Eleanor Roosevelt and C.H. Flowers held at C.H. Flowers High School in Springdale, MD. (Michael R. Smith/The Prince George's Sentinel). Springdale, MD, Friday, February 22, 2019: Daja Claiborne (1) of Roosevelt battles for a rebound during a Prince George's County girl's high school basketball game between Eleanor Roosevelt and C.H. Flowers held at C.H. Flowers High School in Springdale, MD. (Michael R. Smith/The Prince George's Sentinel). 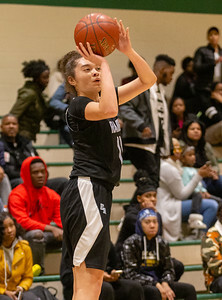 Springdale, MD, Friday, February 22, 2019: In a losing effort, Makayla Adams (11) of Roosevelt scored 20 points during a Prince George's County girl's high school basketball game between Eleanor Roosevelt and C.H. Flowers held at C.H. Flowers High School in Springdale, MD. (Michael R. Smith/The Prince George's Sentinel). 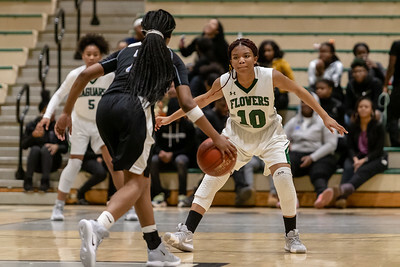 Springdale, MD, Friday, February 22, 2019: Daja Claiborne (1) gets off a shot while surrounded by multiple Flowers defenders during a Prince George's County girl's high school basketball game between Eleanor Roosevelt and C.H. Flowers held at C.H. Flowers High School in Springdale, MD. (Michael R. Smith/The Prince George's Sentinel).